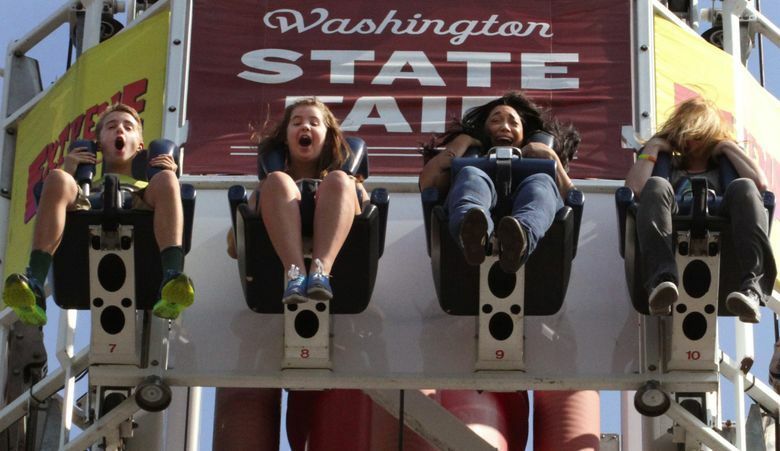 The Washington State Fair opens on Friday, Aug. 31, in Puyallup, with rides, entertainment, exhibits, animals and fun for all ages through Sept. 23. New attractions this year include The Farm at SillyVille for kids, with a Dairy Barn, garden, and Chicken Coop with animatronic chickens. The feature joins SillyVille’s array of rides for kids, and a food court with kids’ value menu. Also new this year is Outpost 47, an all-ages venue with food, beer and wine vendors, free entertainment featuring music-legend tribute concerts, and sports events on big-screen TVs. All the old favorites that make the Washington State Fair the largest single attraction in the state are back, including thrill rides, Hobby Hall display of collections, Home Arts exhibits and demonstrations, vendors hall, floral displays, and animals, sheep, cattle, draft horses, rabbits, goats, dogs and the Piglet Palace, with mama and piglets. Food is another fair mainstay. You’ll find scones, onion burgers, barbecue, roasted corn, ice cream and much more from 175 vendors, and, for adults, the End Zone Sports Bar, Timber Gulch Saloon and Brew Park. On Friday, Aug. 31, admission is free until 12:30 p.m. if you bring a nonperishable food-bank donation, and kids ages 18 and younger get in free Friday through Monday, Aug. 31-Sept. 3. Admission is free on Mondays for members of the military and veterans with ID and their dependents, and Dizzy Pass unlimited ride bracelets are available weekdays starting Monday, Sept. 3. Headliner concerts include Khalid on Saturday, Sept. 1; Florida Georgia Line Sunday, Sept. 2; Seal Sept. 12; Toby Keith Sept. 15; Macklemore Sept. 21; and many more. Attractions with a separate admission charge include Discover the Dinosaurs (daily); Cirque Ma’Ceo Horse Stunt Show Friday through Monday, Aug. 31-Sept. 2; and rodeo competitions and parties Sept. 6-9. The traditional Western Rodeo Parade and Cattle Drive through downtown Puyallup to the fairgrounds is a rodeo weekend highlight Sept. 7, when admission is free until 12:30 p.m. with a donation of school supplies. Cultural celebrations feature Asia Pacific Cultural Center Day entertainment Sept. 15 and Fiestas Patrias food and shows Sept. 16. Fireworks shows are at 10 p.m. every Friday. On Sept. 23, there will be an Ultimate Tailgate Seahawks party, with the game on video walls and activities for all ages. The fair is open through Sept. 23, with closures on Tuesdays and on Sept. 5. A free mobile app for iPhone and Android is available to download on the fair’s website for tickets, directions and to plan your fair day. Transportation options include the Pierce Transit Fair Express daily, and Sounder train specials on Sept. 15 and 22.